I am late to the party this week, but better late than never! Life has been full. Just not of sewing. I made two versions of snowflake #4. The first is version 4. I like the white triangles dancing around the centre star. I also like the lacy doily effect the skinny rectangle makes betweent the star and the triangles. Here is snowflake #4 but done in version 1. Can you believe it's the exact same pattern?! I LOVE that. I tried a busier background as opposed to a monochromatic one, and I do like the effect! That snowflake floats on the background, doesn't it? This CRACKS me up. Think she loves the extra crackle of that freezer paper! She didn't grab for anything, not once, just gazed at the pieces emerging out the back of the machine! If you're wondering about the quilt in the background, it was a pattern I bought many years ago and made about 3 years ago in memory of and tribute to, the very best (cover Bella's ears) cat who has been in my life, my darling Raffi, who lived to be 17.5 years old. She was pure black, even to her eyebrows and whiskers. Can you see her wings? Linking up with Snowalong for week 5! Your snowflakes are great! I love seeing the various versions and the varied colour schemes. What a sweet cat. My pet-deprived daughter is jealous - though she agrees she'd rather keep her allergic dad than get a cat or dog! I need to do my snowflakes too! They are waiting patiently for me! Love your cat and his crazy antics! 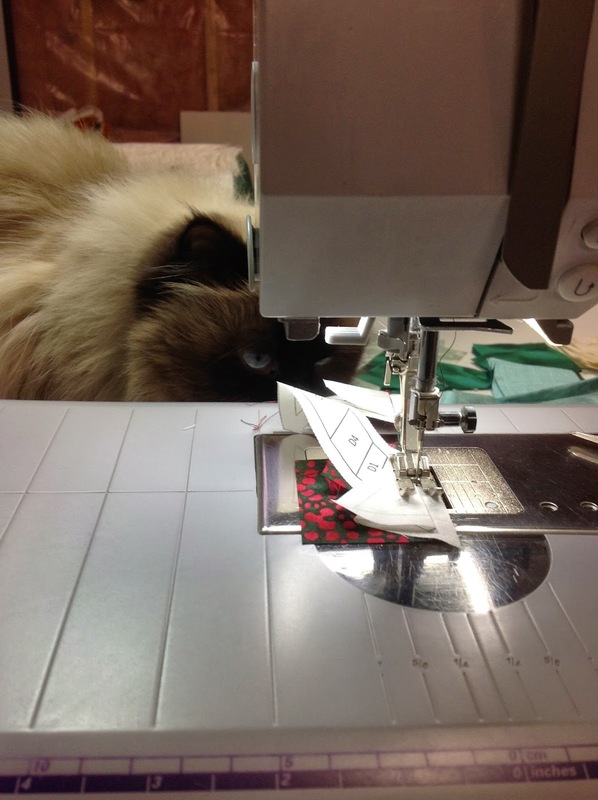 He is a quilter at heart! Why thank you! They are so pretty aren't they? I have another pillow to make today, this one for my youngest daughter. The other two were such a hit. As for my cat, SHE is not speaking to you, lol, as she is so insulted that you thought she was a he! "I'm gorgeous! A male can't touch this!" Lol. You're forgiven in my books however. ;-) You are a no-reply blogger, so this is the only way I can contact you, sorry. Sandra - I must have missed this post! Your snowflakes are gorgeous! That little Bella is a scamp! Love the pictures! What a beautiful thing to do, making a tribute quilt to Raffi.